Diabetes is the 7th leading cause of death in the United States and leads to complications including blindness, kidney disease and amputations. As many as 30.3 million people struggle with some form of diabetes while another 84 million are at risk for developing it because they are currently in a condition called “pre-diabetes”. Statically the group with the most prevalence of diabetes is seniors (65 years or older). The annual costs are in the billions with most of that coming from the direct medical care of a diabetic. (The American Diabetes Association). There are several things that people, especially those in the pre-diabetic category as well as those at higher risk for the condition can do to improve their health. These include becoming more active, trying to get to a healthier weight and eating a healthier and more balanced diet plan. While there are many diet plans to choose from, each person must find the one that works for them in terms of their preferences, beliefs, and lifestyle. Meet all nutritional needs without added sugars. Watch out for tricky terms that “hide” sugars on labels. Watch for the suffix “ose” which usually means sugar in one form or another. Fructose, for instance, is fruit sugar. Meet nutritional standards to qualify as a “meal” including adequate calorie count, proper amount of protein and other nutrients including vitamins and minerals. Should meet standards set by the person’s doctor. A new diabetic should be assigned a nutritionist to work with to help with meal planning and food choices especially during their early days of navigating the condition. Learn to read labels especially meal replacements, snacks and other prepared items. Watch out for artificial ingredients like artificial sweeteners, colors, and preservatives. Acacia gum: Typically used as a thickener and may also work as an appetite suppressant. Can cause side effects ranging from nausea and gas to bloating, indigestion, diarrhea. Erythritol: Sugar alcohol. Used as an artificial sweetener because it is not absorbed by the body leading to zero calories. It can also cause bloating, gas, nausea and indigestion. Another ingredient that is frequently used is stevia or stevia extract. It is a natural ingredient that is many times sweeter than table sugar. It does not raise blood sugar levels at all and is generally considered safe for nearly everyone. 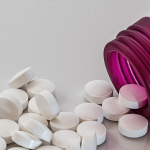 However, there are some concerns about possible side effects including migraines. If you have frequent migraines or other types of headaches, use stevia with caution. Talk to your doctor and get recommendations. Read labels and get informed. If you don’t recognize something research it. Ample K is the Ketogenic formula offered by Ample. It has no GMOs, no excess sugars or artificial sweeteners. It is gluten and soy free. 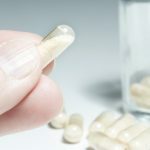 They were developed to be marketed to diabetics specifically and contain what the company calls “Carb Steady” a blend of carbohydrates which are meant to have a slow release in the system to prevent blood sugar spikes. 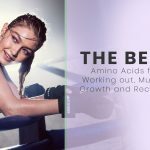 The meal replacement shake here is promising with MCTs (medium chain trigylcerides which help burn fat) and BCAAs (branch chain amino acids which help with muscle repair and recovery). One of the listed ingredients is “vanilla essence” which is an extract made from vanilla beans rather than using the beans themselves. 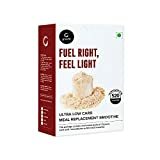 Glucerna Advance Nutritional Shake uses “Carb Steady Ultra” which the company calls a blend of slow release carbohydrates to prevent blood sugar spikes. It has 21 grams of protein, 6 grams of fiber and 7 grams of carbohydrates total per serving. It also provides 10 billion CFU of probiotics per serving. 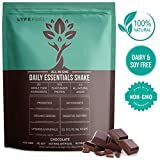 This meal replacement shakes uses pea isolate and sprouted brown rice as its protein source. There are 18 grams of protein per serving here. Ample K is the Ketogenic formula offered by Ample. It has no GMOs, no excess sugars or artificial sweeteners. It is gluten and soy free. It comes in a bottle as a dry powder, so you only have to add the liquid of your choice and shake. 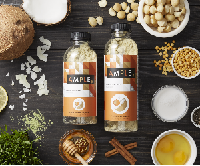 Ample K comes in two different meal sizes a regular meal is 400 calories, and a large meal is 600 calories. It is only available in 1 flavor which is described as a creamy vanilla with a hint of cinnamon. It is 73% healthy fats (a blend of coconut, macadamia and sunflower oils plus chia), 14% protein (grass fed whey, egg whites and pea protein), 7% fiber and prebiotics (chicory root, tapioca, and acacia). Six strains of probiotics provide 40 billion colony forming units (CFUs). Organic greens including wheat grass, barley grass and chlorella round out the nutrition. 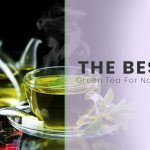 Chlorella or green algae is often used as a supplement or a food additive because it can not only improve the immune system but may also help protect against the accumulation of toxic metals in the body. 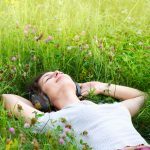 While safe for most people, it does have some potential side effects include allergic reactions, photosensitivity (sensitivity to light) gas and stomach cramping, diarrhea, nausea and discoloration of the stools. Easy to use pre-measured formula in a convenient, BPA free bottle. Glucerna is probably one of the most easily recognized brands of meal replacement shakes on the market. They were developed to be marketed to diabetics specifically and contain what the company calls “Carb Steady” a blend of carbohydrates which are meant to have a slow release in the system to prevent blood sugar spikes. Each serving as 10 grams of protein, 180 calories and 3 grams of fiber. Glucerna is gluten free and available in 5 flavors: butter pecan, chocolate, chocolate caramel, strawberry, and vanilla. There are several problems with using this as a meal replacement shake. First, 180 calories is too low to count as a meal by itself for most people. Second, the extensive list of ingredients reads like any processed food- too many things and too many bad things. There are artificial flavors, colors, and sweeteners as well as other filler ingredients here. Convenient premade drink for on the go ease. The #1 doctor and nutritionist recommended brand for diabetics. Artificial colors, flavors, and sweeteners on an ingredient list that is just way too long. Not enough calories to be counted as a “meal” by itself. Dr. Eric Berg is a chiropractor who specializes in weight loss. He is also an author and sells a variety of products on his website ranging from weight loss to sleep aids. 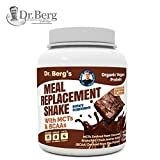 The meal replacement shake here is promising with MCTs (medium chain trigylcerides which help burn fat) and BCAAs (branch chain amino acids which help with muscle repair and recovery). It is dairy and soy free using pea protein instead. There are 11 grams of protein per serving but a mere 80 calories. Even as a snack that would be low but this is being sold as a “meal replacement.” For most people that would be far too little but for diabetics it could be dangerous. It does contain fiber (5 grams), but most people say that they are not satisfied with this product. Not enough calories to count as a snack let alone as a meal. The Grow Fit Ultra Low Carb Meal Replacement Smoothie premix comes in small pouches that you tear open and mix with your favorite beverage. It comes in four flavors including kesar badam (almond and spices), mocha, strawberry, and vanilla. You have the option of buying a variety pack as well. Each serving has at least 500 calories which makes this very good as a meal replacement. 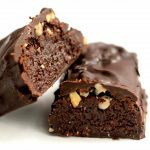 There are 30 grams of protein per serving. It is gluten free and preservative free. Each packet has a shelf life of around 6 months. One of the listed ingredients is “vanilla essence” which is an extract made from vanilla beans rather than using the beans themselves. It is different from the product called “vanilla extract” because of the extraction method used. Ingredient list is difficult to read at best leading to questions of possible misleading practices. 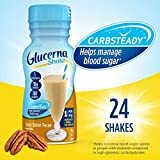 Glucerna Advance Nutritional Shake uses “Carb Steady Ultra” which the company calls a blend of slow release carbohydrates to prevent blood sugar spikes. While this is not spelled out it is clear that there are a number of other ingredients included that should not be there. The listed ingredients reads like a processed food label, and there are several different types of sugars included here. There are 200 calories, 10 grams of protein, 7 grams of fat and 3 grams of fiber per serving. 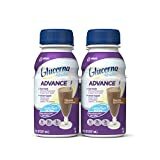 The Glucerna Advance only comes in chocolate or vanilla flavors. 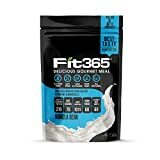 Fit 365 Gourmet shake comes in three flavors: vanilla bean, gourmet chocolate, and caramel coffee “fitaccino.” It has 190 calories per serving making it close to a snack or a very light meal. It has 21 grams of protein, 6 grams of fiber and 7 grams of carbohydrates total per serving. It also provides 10 billion CFU of probiotics per serving.It is gluten free, has no soy, aspartame, sucralose or GMO ingredients. This meal replacement shakes uses pea isolate and sprouted brown rice as its protein source. There are 18 grams of protein per serving here. There are only 100 calories per serving making this at best a good snack replacement rather than a meal replacement. It is made of nutritionally sound ingredients without any of the negative ingredients found in other shakes. It is available in 2 flavors (chocolate and vanilla) and 2 sizes (small and large). No artificial sweeteners or sugar alcohols. Not enough calories to be a good meal replacement shake. Diabetes can be confusing and difficult to manage condition especially for people who are reluctant to make the necessary changes in their lives to prevent complications. It is estimated that over 1.5 million people will be newly diagnosed with some diabetes each year. Even more, will find themselves in the prediabetes category which puts them at direct risk of being diagnosed sooner rather than later. The longer that you are in the prediabetes category, the more likely you will be to become diabetic. Risk factors include: family history, having kidney disease, being overweight or having ever been diagnosed with gestational diabetes. Knowing your risk factors plus the most common symptoms helps you stay on the lookout for the condition. It is important that you monitor your sugar levels with your doctor, try to reach and maintain a healthy weight and try to stay active as well. Eating right may be one of the most difficult challenges facing a diabetic. New diabetics will hear many myths and falsehoods about what they can and cannot eat and may refuse to stick to their program putting their health at serious risk. Others may become so strict with their eating that they fail to find any real balance. 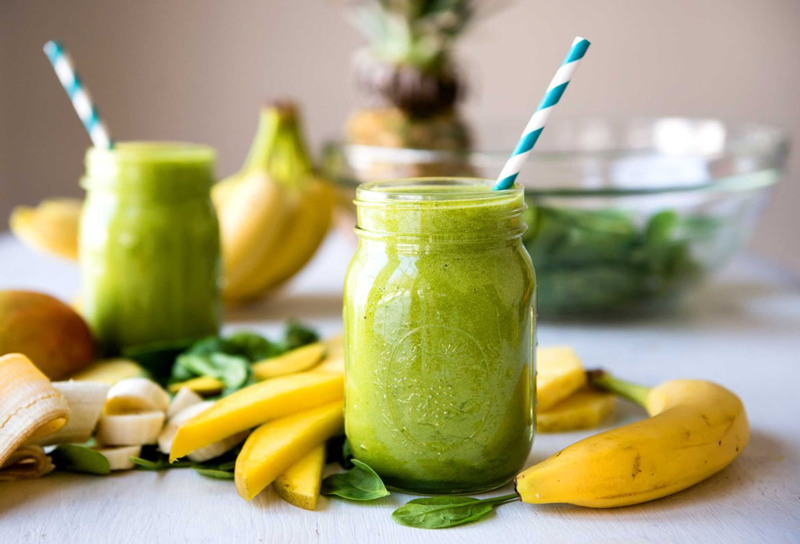 While the goal should be to eat healthy, nutritious foods as much as possible using a good, balanced meal replacement shake can be part of that plan. 1. Adequate calories. Discuss your schedule and eating habits with your doctor. If eating three meals a day works for you, then you should divide your daily calories into 3 meals. The same for 5 meals, 2 meals, and a snack. Whatever works for you is what you should do. Most people should have between 1000 and 1500 calories per day, but your needs may be quite different. Diet plans with daily calorie goals of under 1000 for an adult should be discussed with the doctor first as it may be too extreme to maintain in the long run. 2. A balance of protein, fats, and carbohydrates. It is essential that all three of the macronutrients be represented. Some diet plans like Keto diets emphasize fats while others focus on protein. It is essential to know what your own needs are. Because diabetes can affect the kidneys some doctors limit the amount of protein for their patients. 3. No artificial ingredients especially harmful sugars like aspartame. A good rule of thumb is five ingredients or less and no ingredients that you do not immediately recognize as “food”. 4. Know the sources for the protein. 5. Increasing fiber is a good thing but know that increasing it too quickly can lead to gas, bloating and stomach discomfort. 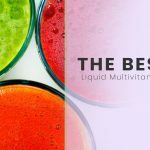 The best meal replacement shake for a diabetic is the one that helps them meet their health goals, stabilizes their blood sugar and gives them energy to lead healthy, happy and complication free lives.